Accounting is the language of business. Businesses rely on accounting and its information systems to evaluate and resolve complex financial problems. Since all business people use accounting to communicate, a sound working knowledge is essential to your rise through the ranks. The study of accounting is a smart place to begin any business career, whether or not you aspire to be an accountant. 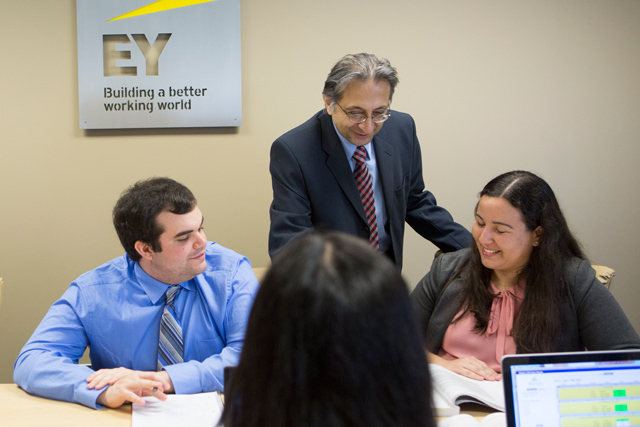 Ranked among the best in the nation, the accounting program at TCNJ has a long-standing reputation for preparing exceptional accountants. Students can expect small, engaging classes in a collaborative setting—including a hands-on audit lab—and close faculty mentorship. Our graduates enjoy remarkable success, with high pass rates on the CPA exam and a 60 to 70 percent recruitment rate with public accounting firms. The department offers a Bachelor of Science in accountancy as well as a pathway for those graduates interested in earning CPA licensure. Strong curriculum standards and great graduation rates earn us the No. 20 nod from Accounting.com. 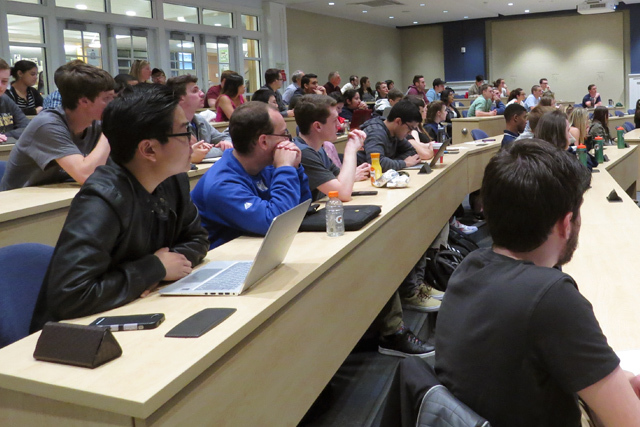 A semester-long colloquium connects accounting majors with professionals from Big 4 CPA firms and more. Audit like a professional—using tools from advanced software to real-time data—in our simulation lab. The combination of a strong curriculum and talented students has earned TCNJ’s accounting program a reputation as one of the best in the nation. Building on the school’s required business core, the program consists of 10 accounting courses that integrate study of the theory and current practice of accounting with research and computer applications. 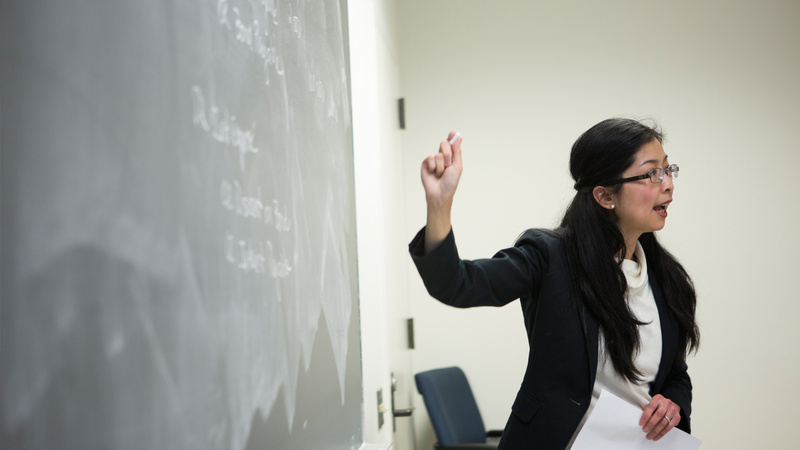 Classes are taught by full-time faculty who are active researchers and experts in specialized accounting fields, including auditing, cost, financial accounting, information systems, forensic accounting, and tax. Opportunities are available to collaborate with faculty on research projects, and students are encouraged to study abroad. The TCNJ accounting program has a strong track record of successfully preparing students for employment in the public, corporate, not-for-profit, and government accounting sectors. The program also provides a pathway for those interested in licensure as a certified public accountant (CPA). Interested in CPA licensure? Candidates must pass the CPA exam and complete 150 semester hours of education to obtain licensure; in many accounting programs, this requirement is fulfilled with a master’s degree. 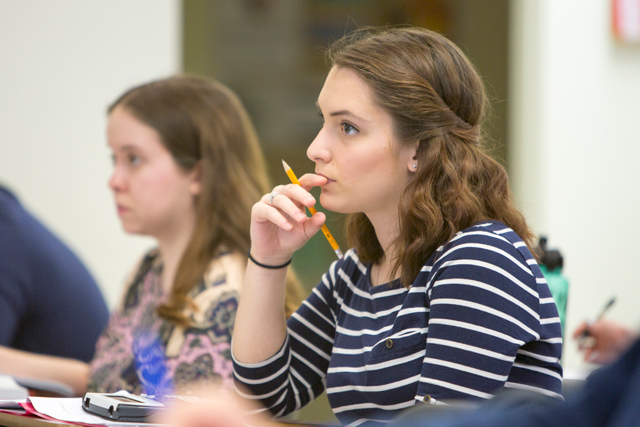 TCNJ students can earn the required credits at the undergraduate level by pursuing a second major, a minor, or electives to round out their program; we encourage students considering CPA certification to pursue a minor in a non-business discipline. The quality of our undergraduate pathway is clear: TCNJ boasts the No. 1 CPA pass rate in the state. Interested in financial services and corporate accounting? Students seeking to specialize in financial sector audits or accounting positions at financial services firms and industrial corporations are encouraged to pursue a minor in finance in addition to a major in accounting. TCNJ graduates with a strong accounting and business valuation background are highly sought-after hires in this sector. The accounting minor provides a solid business foundation that can complement almost any major. Students choose from two tracks: financial accounting or managerial accounting. Each track requires a minimum of five courses, depending on the major. Students enrolled in the Information Systems and Technology (IST) minor will learn how to utilize technology in businesses and other organizations. Information Systems and Technology is an integral part of any business environment; students that understand the strategic value of information systems and how to utilize technology to gain a competitive advantage will find many employment opportunities in global organizations. Students pursuing the IST minor will learn about information systems, systems design, database, project management, web design, and business analytics. In addition, they will acquire the broad managerial and organizational knowledge that is necessary to work in today’s technology-driven global economy. Newly declared accounting majors attend Introduction to the Accounting Profession, a semester-long colloquium surveying the world of accounting and featuring visits from accomplished professionals representing Big 4, national, and regional accounting firms as well as industrial and financial services firms. As sophomores, students take a for-credit course in career planning for accountants, featuring visits with recruiters and professionals and weekly workshops on such topics as résumé development, networking and interviewing skills, and ethics in the accounting workplace. The course helps to prepare students for internships, usually in the junior or senior year. Accounting students are also encouraged to participate in regional and national conferences, with travel expenses supported by TCNJ. In a senior capstone experience, students take a research- and writing-intensive course that blends liberal learning principles—like critical thinking and analysis—with professional accounting practice. Discussion based and student driven, the course transfers primary responsibility for learning from the professor to the student, mirroring the initiative and responsibility expected of the accounting professional in the workplace or graduate school. Deloitte, EY, PwC, KPMG, J&J: Accounting majors typically participate in well-paid internships that often lead to entry-level jobs on graduation with Big 4 accounting firms, Fortune 500 companies, and top-tier financial institutions. More than 70 percent of TCNJ accounting majors complete an internship, with our support and encouragement. We believe that internships are a valuable way to build real-world experience and a professional network. In fact, each year, 90 to 95 percent of our interns receive job offers from their employers. Our proximity to both Philadelphia and New York City—accessible by train from TCNJ—means students have the opportunity to work in two of the largest business centers in the country. We assist students in finding internships by leveraging our alumni network and the professionals at TCNJ’s Career Center. We even have a coordinator within the department to support students by mentoring and supervising their internships. Our graduates enjoy a wide range of career opportunities, working in public accounting firms, all government sectors, and across private industry. Many of our students land their first jobs through internships or on-campus recruitment. All Big 4 public accounting firms, many medium- and small-sized firms, and a large number of private companies visit campus to recruit our students. Some of the most exciting opportunities are in forensic accounting, the study of fraudulent financial activity; these specialists are in high demand by the Federal Bureau of Investigation, U.S. Government Accountability Office, and the Internal Revenue Service. Our program is excellent preparation for advanced study. Graduates have earned law degrees from such prestigious schools as Harvard and Georgetown, most commonly specializing in tax law, while others have pursued academic careers through doctoral study at Rutgers, Villanova, and Temple, among others. Our students apply classroom concepts to real-world practice—while providing valuable services to the community—through both volunteer and course-based projects. Students in the cost accounting class, for example, worked with local youth to develop viable micro-businesses, while students in the managerial accounting class helped a nonprofit organization determine the costs associated with renovating a commercial building for various community uses. Our students also donate their time and expertise to the Volunteer Income Tax Assistance program, assisting low-income taxpayers while gaining experience in preparing tax returns. Institute of Management Accountants Student Chapter provides opportunities for students to visit with professionals, interact with professors in non-academic settings, and share social and business-oriented events. Beta Alpha Psi, the national accounting and finance honor society, provides service and self-development opportunities while building relationships between student members and practicing professionals. National Association of Black Accountants supports students underrepresented in business fields, enhancing their career potential and connecting them with peer and professional networks. Students who enroll in the accounting degree program must take all required accounting courses at TCNJ. Alternate arrangements for a course may only be allowed in case of studying abroad, and with pre-approval in writing from the department. Accounting courses taken at another institution without department pre-approval will not be substituted for TCNJ accounting courses and will not count toward the degree. By definition a culminating experience, this course is to be taken in the last semester: spring for students graduating in May; fall for students graduating in December. It is integral to the purpose of the course that students complete sufficient accounting credits to maximize the learning experience; therefore, students must plan for this course according to their graduating semester.